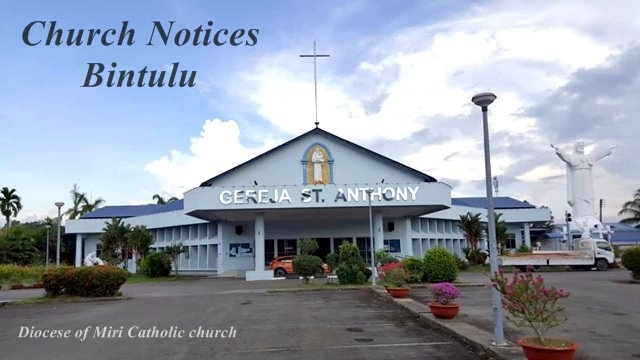 The Bintulu Young Catholic Students are organizing a Youth Camp at the Parish Hall for students aged 13-18. The date for this camp is from 18th till 20th October. Registration can be done after Mass today. The second Confirmation Mass rehearsal is today @ 5pm at St. Anthony's Church. Everyone who is involved should attend. The Bishop will be celebrating the Confirmation Mass on Saturday 7th October at 10.30 am. All are invited. The Parish requires new altar servers for 2018. Boys aged between 12 and 14 who are already baptized and have received Holy Communion are invited to the meeting next Saturday. The St John Bosco Iban Home Cell Group is having a prayer meeting tonight @ 7.00 pm at Stella Maris Church. Parishioners who are conversant in Iban are invited, especially the working youth. Other details are on the Notice Board. The next Pre Marriage Course in Iban will be on Saturday 7th October. Time: 8.00 am – 5.00 pm. Parishioners who wish to be married in Church and those who wish to have their marriages blessed are encouraged to attend this course. The next Infant Baptism (in BM) will be on Saturday 21st October. Parents should register with the Parish Office soon.